Tips & Tricks, and how to get the most out of the table widget. Instead of creating a formula for each employee to display in e.g. a number box, you can create one formula for each value, and display it in a table. With the formulas you can also display e.g. average deal value, won deals or % of target achieved. Click 'Edit' on your table. Choose the 'Time period' you wish to display on the dashboard; e.g. current day, week, month, year or custom. Use the 'Layout' to decide how you want to display the employees. Choose 'Avatars' to display them with their profile pictures in Plecto. 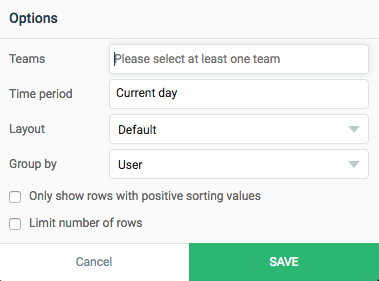 You can choose to see the numbers by users or teams in the 'Group by' drop down. If you click on 'Hide rows that are empty', the table will only show positive numbers. Use 'Limit number of rows' to only see e.g. top 3 or top 10. 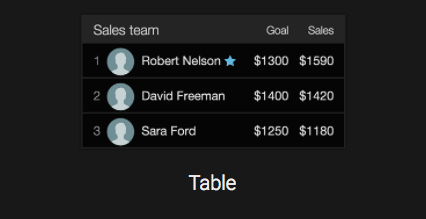 Click here to see our article on how to group by custom fields. Click here to see our article on how to group by a custom time period.